Tulips were once more expensive than gold. A beauty like tulips surely deserves all the riches of the world. To complement the beauty of a special person in your life, you must get some ravishing tulips like the one depicted here. 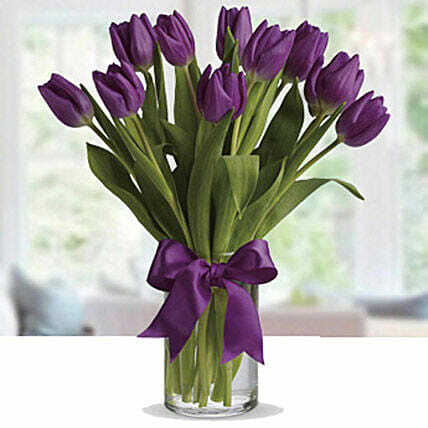 This glass vase arrangement of 10 purple tulips would make your sweetheart happy. Although we try not to, occasionally substitution of flowers are done due to temporary and/or regional unavailability issues. Please be noted that we may have to do this without informing you because we give utmost importance to delivery on time since most of our orders are gifts for a certain occasion. When your flowers arrive in a bunch form, remove the packing and allow them to breathe. Cut 1-2 inches of the stems, remove the leaves below the water line and put the flowers in a vase with clean water. Once in 24 hrs, please cut about 2 cms of the bottom of each flower stem and change the water. When your flowers arrive in an arrangement form i.e., flowers are fixed on to a floral foam, then you just need to ensure that the foam remains wet throughout the day. For this just pour water on the foam so that the foam is completely hydrated. In the case of an arrangement, you don’t need to cut the stems.